You’re saying something very important here about humanity and about not judging others. I really like it. Thanks Fran… Why is it that anything worth writing is such a struggle to pin down? Before I read your post this morning, I had acknowledged a need in myself to be more open to others. 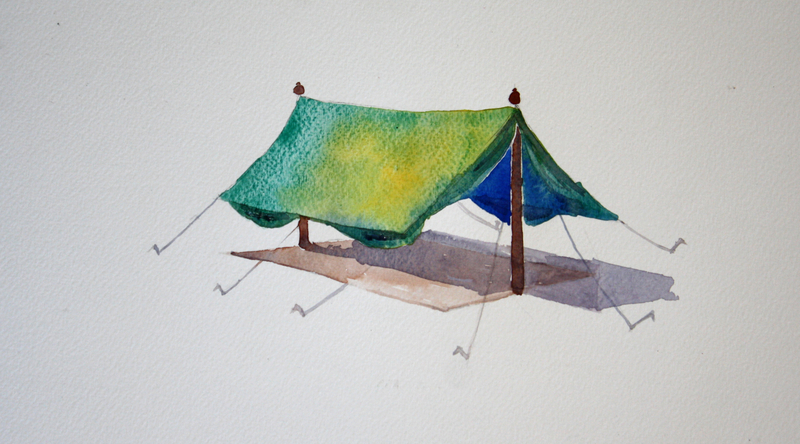 The gorgeous water coloured tent, drew my attention, then your words reinforcing my thoughts. God working through you to me, thank you. Thanks! I LOVE it when that happens. When I saw your tent. …I immediately felt the poles represented Jesus and the Father, with the open sides representing the wind of the spirit. It was a beautiful picture of strength and power in the Godhead activating freedom!